Grimshaw Architects and Wilkinson Eyre have been selected, alongside engineers Arup and WSP, to design stations in Birmingham and London for the high-speed rail network HS2. Grimshaw Architects will work with WSP's UK office to create a station for HS2 services at Birmingham Curzon Street, while Wilkinson Eyre and Arup will design the Birmingham Interchange station. Grimshaw Architects and Arup have also teamed up for an interchange at London Euston, with initial plans for a new entrance and 11 additional platforms submitted in 2015. In the north-west of the capital, Wilkinson Erye and WSP have been appointed to create a station at Old Oak Common. Sadie Morgan, the co-founder of London architecture practice drMM and chair of the HS2 Design Panel, said these four "iconic" stations will "set new standards in design and ease of use, and provide a legacy of great architecture of which Britain can be truly proud." The stations will form part of the first phase of HS2, which will connect central London with the West Midlands. The first services on the route are expected to be in operation by 2026. A second phase will connect Birmingham with Manchester, Leeds and Sheffield. Each of the four stations is expected to include shops, offices and cultural offerings, as well a step-free access, with "timeless design" offering the option of future adaption. "Our new stations in London and Birmingham will be at the heart of the first phase of the project, increasing capacity, improving journeys and helping to unlock opportunities for tens of thousands of new jobs and homes around what will be four new landmark buildings," said HS2 chief executive, Mark Thurston. "Appointing these leading creative firms ensures that passengers on our world-class railway will experience modern and accessible stations," added HS2 minister Nusrat Ghani. "I am confident that these firms will deliver these projects at value for money, with designs that are both innovative and in keeping with their surroundings." Grimshaw Architects and Wilkinson Eyre have worked on a number of major infrastructure projects in recent years. 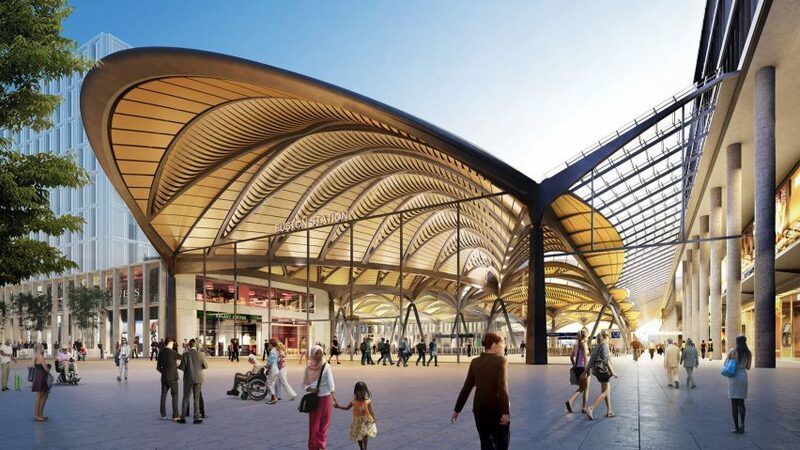 Grimshaw Architects is currently putting the finishing touches to an extension to London Bridge station, and has recently unveiled plans for the first Eden Project in China as part of the ecological park's international expansion plans. Wilkinson Eyre is currently working on a pair of skyscrapers near London's Blackfriars Bridge, and has previously created a kilometre-long cable car route over the River Thames and a major venue for the 2016 Rio Olympic Games.